So, you wanna blog eh? Good decision. Putting new content on your site on a consistent basis is one of the best ways to get Google loving your site… and in return over time an increase in Google search rankings (when you blog like we teach you to in the Blogging For Leads Training we created). 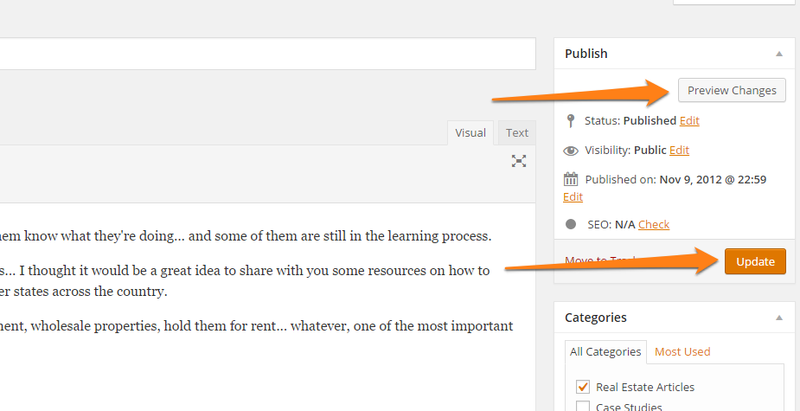 On this page we’ll dive into how to post a blog post on your Carrot website. Plus, at the bottom of this page we’ll dive into ideas on what to write blog posts on. Using the Carrot system to write blog posts is simple. The steps are below. how your post will show up in Google search results. Step 5: Publish that puppy! There are some advanced options you can choose to use on your blog posts if you want. Check them out below. Let’s say you want to write a few blog posts at once, but want them to post sometime in the future. Well you can do that. in the upper right corner of the post edit screen. 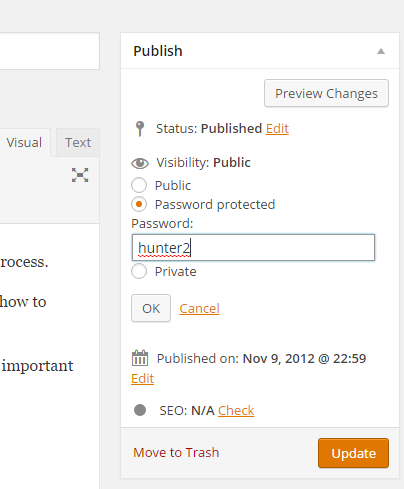 to go live, click “Ok”, and last click the big orange “Publish” button. That post is now scheduled to post on the date and time you chose. Cool, eh? If you want a post (or a page works the same way) protected behind a password, you can do that in about 2 seconds. 1. 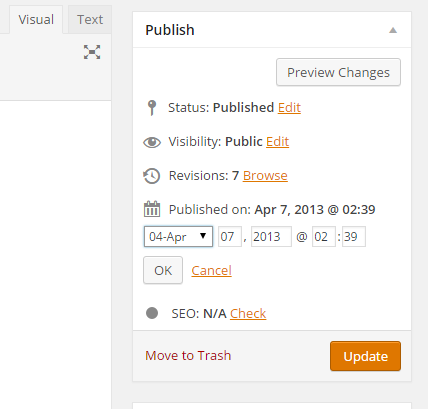 In the Publish box in the upper right corner of your post or page edit screen, click the “Edit” button next to the “Visibility” area. By default posts and pages are “Public”, which means everyone can see them. To password protect it, choose “Password protected” from the choices, then set a password, and click “Ok”. 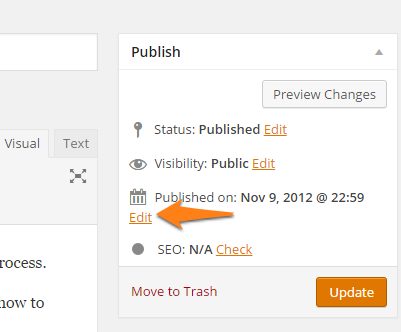 Last, click the orange “Publish” button (if you haven’t published the post or page yet. If you have published it already the orange button says “Update”). The word “blog” has had many different meanings over the years. If you’re thinking about a blog for your real estate business as a place to post your deep inner thoughts and what you ate for dinner… that’s not the kind of blog that we’re talking about. When we post a blog post on our website it’s always with a specific purpose. It may be to answer common questions that your prospect has, which sets you as the expert in your field and builds trust. It may be to post updates about your company, like hiring a new team member or a charity event that you did. It may even be to specifically try to rank well in Google for a certain keyword phrase. Whatever you do, every blog post you put on your website should have a specific purpose… NOT to just get something online. 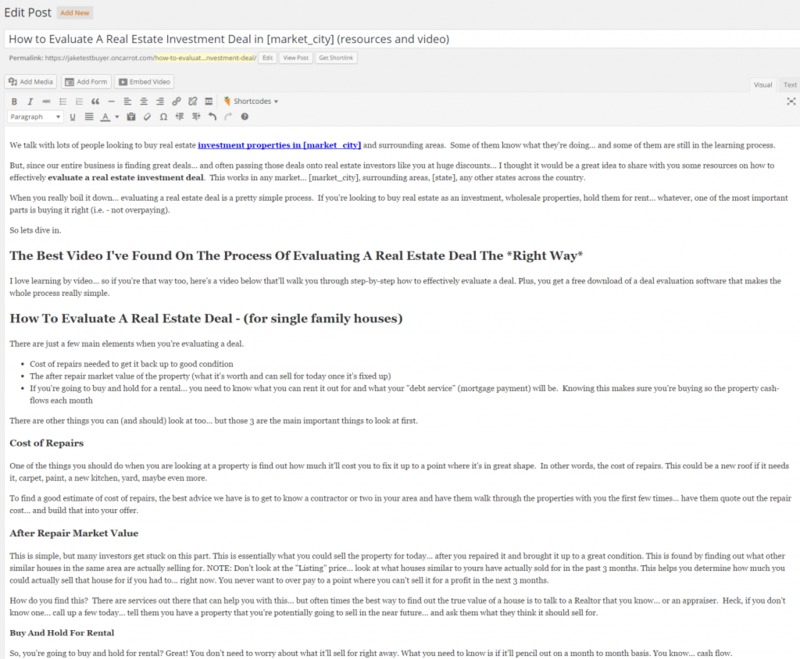 Here are some ideas of things you can write about on your real estate website blog. Exciting company updates: Do you have news about your company that would help to build credibility or make your prospect feel closer to you? Like hiring new team members, charity events you participated in, projects you finishes successfully, case studies, or even awards your company received? Awesome, post these on your blog! They help build credibility and a connection with your prospect. Answers to common questions: Are there certain questions that you find your prospect asking over and over again? These are great opportunities to write a blog post about them and answer them. That way your prospects can have that question answered before it becomes an objection, it builds you as a trusted expert. Content specifically to go after a search phrase in Google: Lot’s of people search things online that you’re not currently optimized for. How do you go after those keyword phrases? Well, we write a blog post on them. 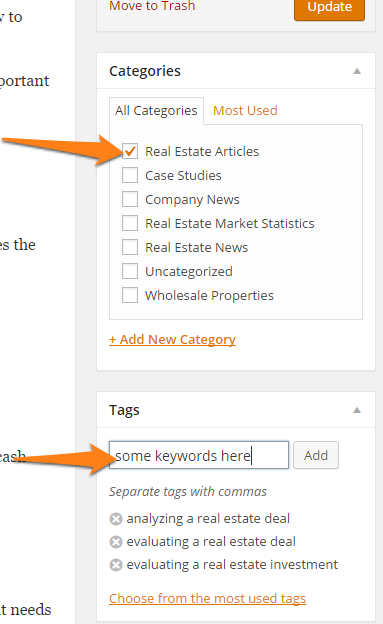 If you’re going after motivated sellers, use our Content Pro system to launch articles that are based on actual keyword research of what sellers are typing into Google. If sellers are searching things online… like “selling my house in divorce in phoenix”… you can capture extra traffic and leads by writing an article optimized for that on your Carrot site. Case studies: One of our favorites are case studies of projects / deals you’ve completed. Lets say you just completed a multi-family acquisition… walk through that acquisition on your website. Lets say you helped a seller who inherited a house, by buying the home, rehabbing it… and getting a new homeowner in the house. Post pictures, the story, and a quote from the seller on how you helped them. Easy peasy. As far as how often, the sweet spot is weekly (on Tuesday, Wednesday, or Thursday). But if you can only get a blog post launched monthly that’s better than nothing. And as always, if you have a plan that includes the Content Marketing System… leverage our content to give you a jumpstart and mix in your own content as you go.